London, United Kingdom: InfraCo Africa, part of the Private Infrastructure Development Group (PIDG), has signed a Shareholders Agreement with Berkeley Energy, committing US$30m of equity investment to the ground-breaking Corbetti Geothermal project, doubling its original commitment of US$15m. In 2015, InfraCo Africa formed a joint venture company with Berkeley Energy to jointly become the majority shareholder in Corbetti Geothermal. At the time, InfraCo Africa committed up to US$15m to the project, with US$5m for early-stage site development and project contracts and up to US$10m for the equity financing of the exploration drilling. 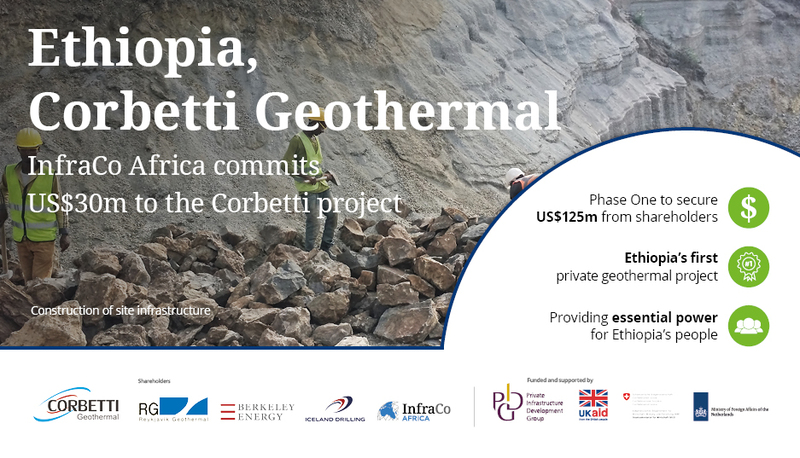 To mitigate the higher risks of a greenfield site, proving a new geothermal resource and being the first privately financed IPP in Ethiopia, Corbetti will be developed in multiple phases. InfraCo Africa’s increased commitment provides the project with US$25m equity finance and US$5m as standby equity. This will contribute around 20% of the funding required to start construction of exploration drilling wells this year and 10-20MW pilot power plant the following year. It is anticipated that the power plant will provide first power to Ethiopia’s national grid by early 2020. As well as public risk capital, InfraCo Africa brings project management and geothermal expertise to the project. InfraCo Africa’s Tim Jackson, an experienced geothermal developer, has been instrumental in bringing international expertise to the geothermal peer review group, which will help to better understand the geoscience data and optimise well drilling locations. Through Tim, InfraCo Africa has also instigated a review of technology options for the power plant and of managing, mitigating and insuring exploration drilling risks. InfraCo Africa is committed to developing high-quality projects and leading the implementation of market best practices. It therefore also undertook a gap analysis of Corbetti’s environmental and social impact assessment and reviewed the project company’s governance and health and safety practices. The project has also undertaken additional environmental studies and conducted an innovative social survey of local communities, using tablet technology (funded by the PIDG). InfraCo Africa is committed to extending the development impact of its projects by adding ‘bolt-on’ water initiatives, where possible. To enable this at Corbetti, InfraCo Africa has secured funding from Technical Assistance Facility (TAF), a sister PIDG Facility. This will be used to finance a pilot project for the local provision of potable water and improved sanitation, generating health benefits for local families. TAF grant funding will also be used to study the feasibility of using bi-products from the geothermal plant (such as waste heat) for developing local industries such as garment manufacturing, improving efficiency and creating new employment opportunities. As Ethiopia’s first private geothermal project, Corbetti partnered with Ethiopia Electric Power (EEP) and the Government of Ethiopia (GoE) with all parties working to draft the regulatory frameworks and legislation required to unlock geothermal potential in the country. The project also drew on Donor support to engage the East Africa Geothermal Energy Facility (EAGER) in this process. This has benefited, not only Corbetti but also other local geothermal projects, for example Tulu Moye, with both projects signing Power Purchase Agreements on December 19th last year. The impact is substantial: the Ministry of Water and Energy forecasts an increase in geothermal generation from 7MW in 2012, to over 1000MW by 2030. InfraCo Africa’s initial commitment to Corbetti was made because of the potential for geothermal power to transform Ethiopia’s energy mix and the enormous challenge faced by the project in being the first private sector led development of an unproven resource. Today’s increased commitment to US$30m is a recognition of the progress achieved by the project and its leading role to date in pioneering geothermal power; it is also a promise to continue broadening the impact of Corbetti, to transform not just the national supply of power but also economic opportunities and living standards in the local area.